In PTC Windchill 10.2 M010, if a valid change notice template exists, you can specify a template when creating a change notice from a change task. 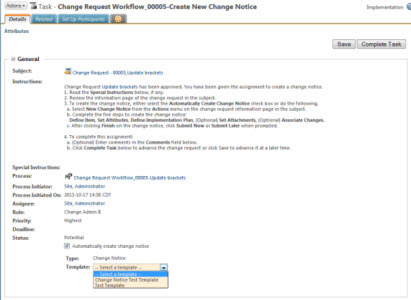 The change notice template attributes, change notice template attachments, and change task templates are propagated to a new change notice. Users creating change notices in the workflow activity can now access available change notice templates right in their workflow task. This allows streamlining of the process by reducing user navigation while giving access to templates that contain a predefined change notice and change activity. You can specify a template when creating a change notice from a change task.